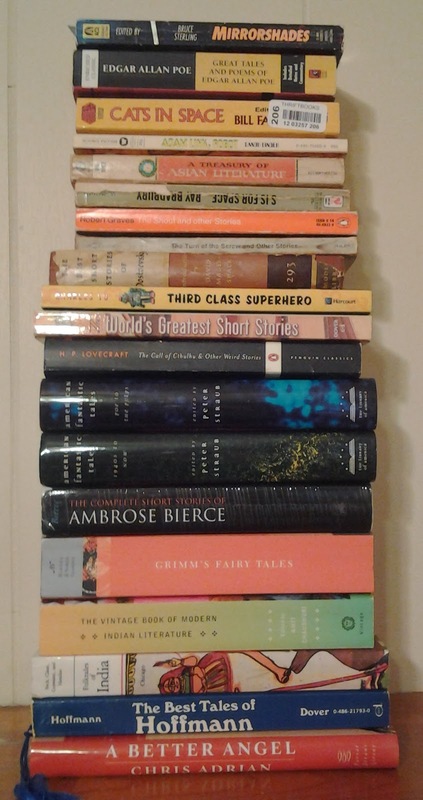 I've been thinking a lot about a new reading challenge for 2014. 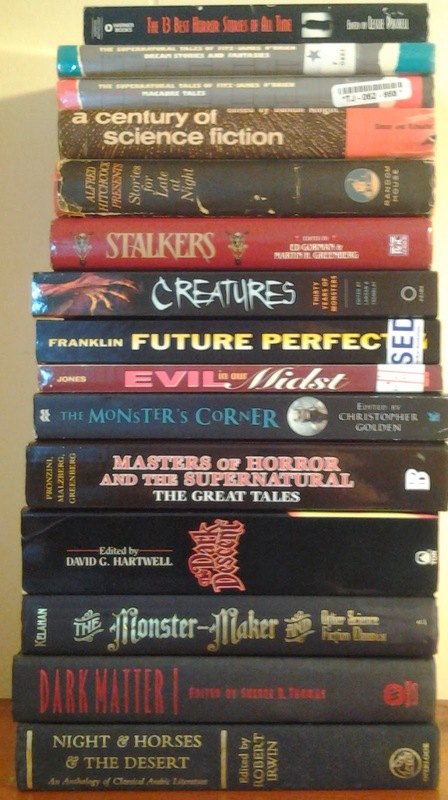 I had several different ideas including reading massive books (i.e. 1000 pages or more), reading the entire works by a singular author or some other challenge. What I've settled on is reading a 365 short stories and writing about all of them. I came to this idea because I realized that while I do like short stories and in particular, good anthologies, I don't read them enough. Usually, this is because I don't find anthologies as engaging audiobook format. Like poetry, I need to slow down when reading these to absorb them more whereas a longer written work, I don't need to. That is, the longer the work, the easier it is to listen to but the shorter the work, the more likely I'm going to enjoy more by reading it rather than listening to it. 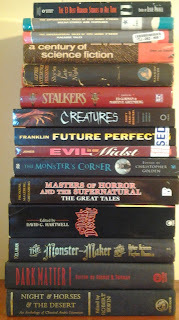 Another motivation for this idea is that I have a large stack of anthologies that I've collected over the years (see the two pics for specifics) that I want to work through and finally actually read. Finally, I also like the exposure of reading works from many different authors and hope to find some new favorites. 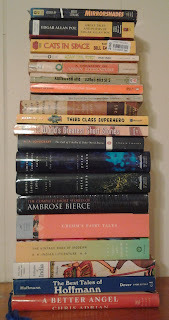 For the 365 Books a Year challenge, I updated readers every month with some comments about the best (or worst reads) along with a line listing and breakdown of whether they were books, audiobooks, or graphic novels. However, I plan to execute the 365 Short Stories a Year a bit different. The goal will be to read text-based 365 short stories in a year. Preferably, it will be one a day. However, sometimes, I may stock up on a couple if I fall behind in my schedule or know that the upcoming schedule is going to be too busy. Regardless, I will read these--not listen to them. I think the play-by-play reflection will offer me the opportunity to think more deliberately about what I'm reading and hopefully, offer up some great (or not so great) recommendations for readers of this blog to enjoy.